Q. How do I find a specific journal article? 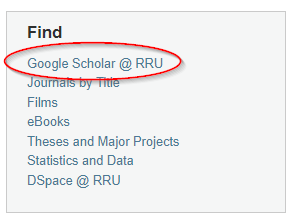 Start from the Library homepage and use Google Scholar @ RRU to search for the article title. 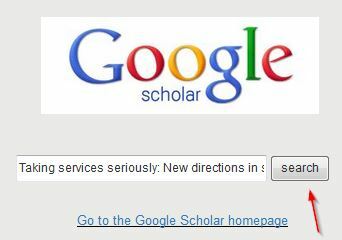 It's important to start your search from the library homepage to increase your chances of finding the full text and avoiding paywalls. Enter the title of the article you want and click on the 'search' button. Log in with your RRU username and password [not pictured]. Click on the 'Full-Text @ RRU' link. If you do not find the article this way, you can ask us to obtain a copy for you through our interlibrary loan service. Find more information available here.